The loss of even one natural tooth can result in devastating consequences for patients. Suddenly, your smile doesn’t look or feel right anymore; this may leave you unwilling to laugh with friends, eat your favorite foods for fear of discomfort, or even admire your appearance in a mirror. 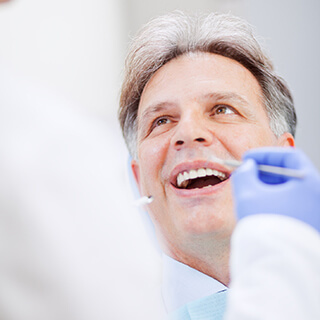 Dr. Mitchell’s team is committed to helping all patients avoid the loss of teeth, but if that day comes, we offer several excellent replacement solutions, including state-of-the-art dental implants. With implants, it’s never been easier to turn back the clock and rebuild attractive, functional teeth you can rely on. We have two convenient locations in Fayetteville or East Point, GA – contact us if you’d like to arrange a consultation. 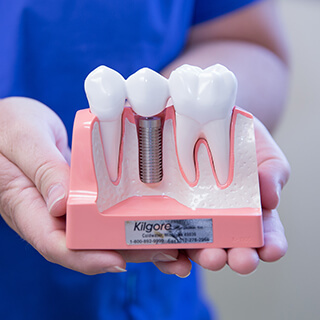 Unlike traditional bridges and dentures, dental implants replicate your entire natural tooth versus just the visible crown that sits on top of the gum line. Some patients may ask why the portion hidden under the oral tissue (the root) is so important. Your jawbone needs constant stimulation to remain robust and healthy, and the tooth roots provide that vital function. When the roots are gone, patients will experience gradual bone loss over time – that’s why many elderly people have a facial appearance that appears collapsed. Dental implants help patients avoid this problem by providing a brand-new tooth root and a restoration to match, improving your oral health and seamlessly improving your overall appearance and smile. If it is determined that you are a suitable candidate for one or more dental implants, the first step is a surgical procedure. During this procedure, the new implant(s) are inserted into the jawbone so that they can effectively become the new “roots.” Many general dentists refer their patients to specialists for this process, but Dr. Mitchell has undergone the advanced education and training necessary to place implants right here in-office for maximum patient comfort. We know how nice it is to work with a dental team you already know and love! Once the implants are successfully inserted and covered, the healing process begins. During this time, your oral tissues begin to grow around the implant(s) and bond with them. The process typically takes a few months, but in the end, you will have a sturdy, lasting foundation for replacement teeth. What Implant Restoration Options Are Available? 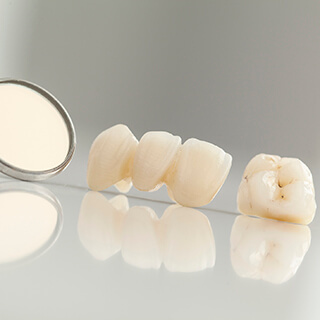 If you have a single missing tooth/implant, an all-ceramic dental crown can provide effective, conservative coverage that keeps your smile healthy. When multiple teeth/implants require coverage, Dr. Mitchell is likely to recommend an implant-retained bridge and/or denture. These prosthetics are designed to sturdily attach to several implants at once, providing the same great level of reliability at a more cost-effective price. These appliances can be fixed (permanent) or removable in nature, depending on each individual patient’s circumstances and preferences.